I think I might have solved the issue with this thing losing connections, albeit at a price. Sometimes I lost WiFi, sometimes, the Internet, and sometimes the thing just didn't work right. 1. Put it on one of those cheap laptop coolers that are powered by USB. I just plugged mine into a powered USB hub I already have. There is an 80mm fan sitting right under the router (and my ooma hub on the other fan) that keeps it room temperature. 2. Turn of the 'N' wireless. Painful, but using just the G WiFi seemed to help even more than #1 maybe. 3. Assign static DHCP address to your devices. It's in the menus somewhere. 4. Do a hard reset and reconfigure. Really, judging by all the problems people mentioned with WiFi, I bet #2 is actually the most responsible. Losing 'N' stinks, but only my Macbook had it anyway. It's still not a horrible deal to get 54G and gigabit routing. Knock on wood, I haven't had any problems in days. My daughter broke her phone charger and I picked up a Firefly branded phone like the one above for $10 at a going out of business Ritz Camera store. It was not branded and none of the labeling or anything said it was an AT&T or Cingular phone. You are supposed to use the prepaid SIM that comes with it. The good news is it worked with her AT&T contract (not prepaid) SIM without having to be unlocked. 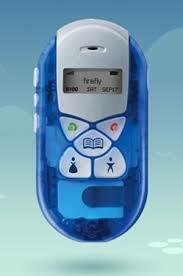 So if you parents need a cheap kid friendly phone, it may be worth a shot to buy an old Prepaid firefly and use your AT&T/Cingular SIM in it. My daughter sleepwalks. So last night here she comes, stands by the bed, paces around a little bit. Standard. Here comes my son a few seconds later, wearing a green windbreaker. Which is exactly one windbreaker more than he went to bed wearing. He has a big grin on his face like he's got a joke or he's up to something. Nope, he's asleep too. Lays down with one leg on the bed, the other he's standing on the floor with. He says he was cold. Still asleep. Next morning he doesn't remember anything. Standard. The other night he comes in, wanders around a little, goes to the toilet. Comes back and hops up in the bed and picks up the remote. "No, let's go to your bed." Someday I'm going to hear something in the kitchen and find him cooking something or something else equally crazy. Maybe I could get them to sleepclean their rooms? I'm commenting on this article. It's an AP article about the first Hispanic candidate to the Supreme court. I seem to remember a long time ago, at least it is rumored to be so, that the press reported the facts as news. 'Facts' meaning confirmed by multiple sources, people on the scene, references to other articles, and a general consensus of what is accepted reality. (Strange that I'd need to define 'facts', but there it is.) Let's also say reality filtered by perception but told as best as one honestly sees it. Why bring up race and gender at all? I don't give a flip if Sonia Sotomayor is a green gender neutral alien from planet Zort, I just want to know where she stands on the issues and how she's going to uphold the Constitution. Nothing against the Zortians, they're good folk. Oops, the article didn't mention any of that sort of thing, just some touchy-feely stuff about her hard childhood, race, gender, American dreams, opportunities and experiences, etc. I'm not knocking the lady, just the 'reporting'. I'd hope by now we can see past race, gender, social strata, etc. but the article highlights that, and mostly ONLY that, and I guess we're supposed to judge accordingly somehow. If we choose 'yea' based on that, we're wrong, and if we choose 'nay' based on that, we're wrong. What's even funnier is that she was nominated as a federal judge by George H.W. Bush but it's already assumed I guess that she will be opposed by the Republicans. I'm not sure on what basis except a reported conservative 'they' describing her as "a judicial activist who would put her feelings above the Constitution". Seems like a fair reason to oppose someone if it's true, so call me crazy. Useful facts please? Or is that too much to ask?